This is the fifth and final post in a series of posts on how to build a Data Science Portfolio. In the previous posts in our portfolio series, we talked about how to build a storytelling project, how to create a data science blog, how to create a machine learning project, and how to construct a portfolio. In this post, we’ll discuss how to present and share your portfolio. 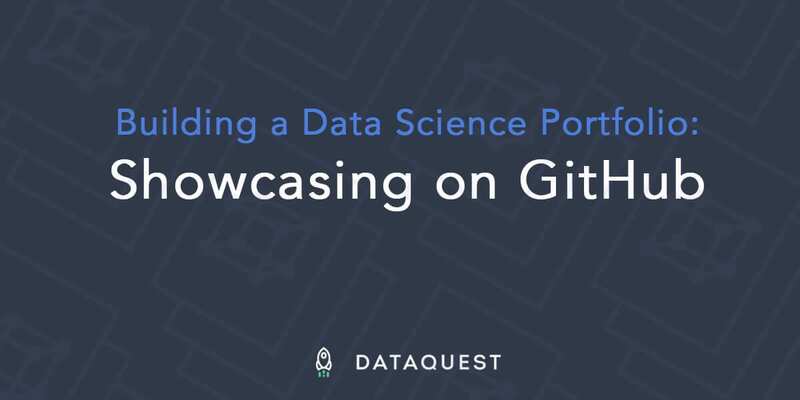 You’ll learn how to showcase your work on GitHub, a popular site that hosts code repositories, data, and interactive explorations. In the first part of the post, we’ll cover how to upload your work to GitHub. In the second part of the post, we’ll cover how to present your work on GitHub, and how to impress hiring managers. Before diving into this post, you should have a couple of projects that you want to showcase. If you need some inspiration, you can consult our previous posts via the links above. If we make another checkpoint with git, we’ll be able to go back to the first checkpoint whenever we want, and switch between the two freely. A checkpoint is more commonly known as a commit, and we’ll be using that term going forward. We can upload the commits to GitHub, which enables other people to see our code. git is much more powerful than just a commit system, and you should try our git course if you want to learn more. However, for the purposes of uploading your portfolio, it’s fine to think of it this way. Set up your git email by typing git config --global user.email YOUR_EMAIL. Replace YOUR_EMAIL with an email account. Set up your git name by typing git config --global user.name YOUR_NAME. Replace YOUR_NAME with your full name, like John Smith. Create a GitHub account. Ideally, you should use the same email you used earlier to configure git. The above setup will let you push commits to GitHub, and pull commits from Github. You can download the zip file of the folder yourself here and use it in the next steps. You can extract it with any program that unzips files. This will create a folder called .git inside the loans folder. You’ll get output indicating that the repository was initialized properly. The contents of the .git folder aren’t necessary to explore in this tutorial, but you may want to look through and see if you can figure out how the commit data is stored. You’ll see that we’ve added the README.md file to the staging area, but there are still some untracked files, that haven’t been added. We can add all the files with git add ..
$ git commit -m "Initial version"
The -m option specifies a commit message. You can look back on commit messages later to see what files and changes are contained in a commit. A commit takes all the files from the staging area, and leaves the staging area empty. $ git commit -m "Update README.md"
You may have noticed that the word master appears after many of these commands are executed. master is the name of the branch that we’re currently on. Branches allow multiple people to work on a repository at once, or one person to work on multiple features at the same time. Branches are extremely powerful, but we won’t dive into them here. If you’re interested in learning more, our Dataquest interactive git tutorial covers working with multiple branches in detail. For now, it’s enough to know that the primary branch in a repository is called master. We’ve made all of our changes so far to the master branch. We’ll be pushing master to GitHub, and this is what other people will see. Once you’ve created a commit, you’re ready to push your repository to GitHub. In order to do this, you first need to create a public repository in the GitHub interface. Clicking the “+” icon in the top right of the GitHub interface, then “New Repository”. Enter a name for the repository, and optionally enter a description. Then, decide if you want it to be public or private. If it’s public, anyone can see it immediately. You can change a repository from public to private, or vice versa, at any time. It’s recommended to keep the repository private until it’s ready to share. Note that creating a private repository requires a paid plan. When you’re ready, click “Create Repository” to finalize. The options for using the repository. Writing objects: 100% (7/7), 608 bytes | 0 bytes/s, done. Viewing the project files and README. Congratulations! You’ve now pushed a repository to GitHub. If you want to make it public, you can follow these instructions. The output is the library name, then a version number. The above output tells us that we have Django version 1.10.5 installed, for example. It’s common when you’re working locally to hardcode absolute paths to data files, like /Users/vik/Documents/data.csv. Other people who want to run your project won’t have those same paths on their computer, so they won’t be able to run your project. You can fairly easily replace these with relative paths, which allow people who have the data in the same folder as your project, but don’t have the same absolute paths, to use your code. It’s generally a good idea to put the data in the same folder as your project, or in a subfolder, to make relative paths and loading the data easier. Note files like __pycache__, main.pyc, and temp.json. The main code of the project is in main.py, and the data is in data/test.csv, and data/train.csv. For someone to run the project, those are the only files they need. Folders like __pycache__ and main.pyc are automatically generated by Python when we run code or install packages. These enable Python scripts and package installation to be faster and more reliable. However, these files aren’t part of your project, and thus shouldn’t be distributed to others. The content of the .gitignore file is a list of files to ignore. This will ensure that these files are not tracked by git, and added to new git commits when you run git add .. However, if you’ve already added the files to a git commit before, you’ll need to remove them first with git rm temp.json --cached. It’s recommended to create a .gitignore file as soon as possible, and to add entries for temporary files quickly. You can find a good starter gitignore file here. It’s usually recommended to use this as your .gitignore file, then add new entries as needed. It’s a good idea to ignore any dynamic, generated, or temporary files. You should only commit your source code, documentation, and data (depending on how large your data is — we’ll cover this in another section). Many projects use secret keys to access resources. A good example is api keys, such as AWS_ACCESS_KEY="3434ffdsfd". You absolutely don’t want to share your secret keys with other people — this allows them to access your resources, and could cost you money. In the above code, "34343434fdfddf" is a secret key that we’re passing into a library to get a weather forecast. If we commit the code as is, anyone browsing Github will be able to see our secret data. Fortunately, there’s an easy way to fix this, and enable anyone using the project to supply their own keys, so they can still run the code. The above code defines a key called API_KEY. It also tries to import from a file called private.py, and doesn’t do anything if the file doesn’t exist. The code uses API_KEY from the settings file, which equals "34343434fdfddf"
The next time you make a git commit, private.py will be ignored. However, if someone else looks at your repository, they’ll see that they need to fill out settings.py with their own settings to get things to work properly. So everything will work for you, you won’t share your secret keys with others, and things will work for others. It’s important to look at the user agreement when you’re downloading a data file. Some files are not allowed to be redistributed. Some files are also too large to make downloading useful. Other files are updated quickly, and distributing them doesn’t make sense — you want the user to download a fresh copy. In cases like these, it makes sense to add the data files to the .gitignore file. This ensures that the data file won’t be included in the repository. It’s important to have information on how to download the data in the README.md, though. We’ll cover this in the next section. The README file is very critical to your project. The README is usually named README.md, and is in Markdown format. GitHub will automatically parse Markdown format and render it. You want an average technically competent stranger to be able to read your README file and then run the project on their own. This ensures that more technical hiring managers can reproduce your work and check your code. You can find good README examples here and here. It’s important to go through the installation steps yourself in a new folder or on a new computer, to make sure everything works. In this project, I analyzed data on loans issued through the [LendingClub](https://www.lendingclub.com/) platform. On the LendingClub platform, potential lenders see some information about potential borrowers, along with an interest rate they'll be paid. The potential lenders then decide if the interest on the loan is worth the risk of a default (the loan not being repaid), and decide whether to lend to the borrower. LendingClub publishes anonymous data about its loans and their repayment rates. Using the data, I analyzed factors that correlated with loans being repaid on time, and did some exploratory visualization and analysis. I then created a model that predicts the chance that a loan will be repaid given the data surfaced on the LendingClub site. This model could be useful for potential lenders trying to decide if they should fund a loan. You can see the exploratory data analysis in the `Exploration.ipynb` notebook above. You can see the model code and explanations in the `algo` folder. The summary here is that the README is the best way to sell your project, and you shouldn’t neglected. Don’t spend a lot of effort making a good project, then have people skip looking through it because they don’t find it interesting! A function to count the number of rows that deal with performance for each loan. Each row in the source text file is a loan_id and date. If there's a date, it means the loan was foreclosed on. We'll return a dictionary that indicates if each loan was foreclosed on, along with the number of performance events per loan. # Read the data file. # Add the loan to the counts dictionary, so we can count the number of performance events. In the above, it’s much more clear what the function is doing, and why. It’s important to reduce the mental effort of following your logic as much as possible. Reading code is time consuming, and not everyone looking through your project will make that investment. Comments make things smoother, and ensure that more people read through your project. Ensure all explanations in the notebook are clear and easy to follow. You can learn more about this in our previous blog post. The second and last steps is especially important. You want people to be able to easily figure out that your analysis is in the notebook, and what analysis you did. A notebook with only code cells is very hard to follow, and doesn’t demonstrate your data science skills. Employers are looking for people who can code and communicate effectively. The repository settings button is at the right. If you have dozens of projects, and don’t want to add links to each repository in your resume, one strategy is to make a single Github repository called portfolio. In the README of this repository, list all of your projects, along with a short explanation of each one and a link. This will enable you to share a single link, but still let people see all of your projects. Make sure to provide good explanations, so people are willing to click through! You should now know enough to put your portfolio on Github, and impress hiring managers. If you have any comments or feedback about the post, we’d love to hear from you. 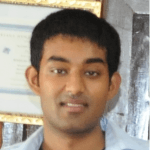 How to setup up a data science blog.